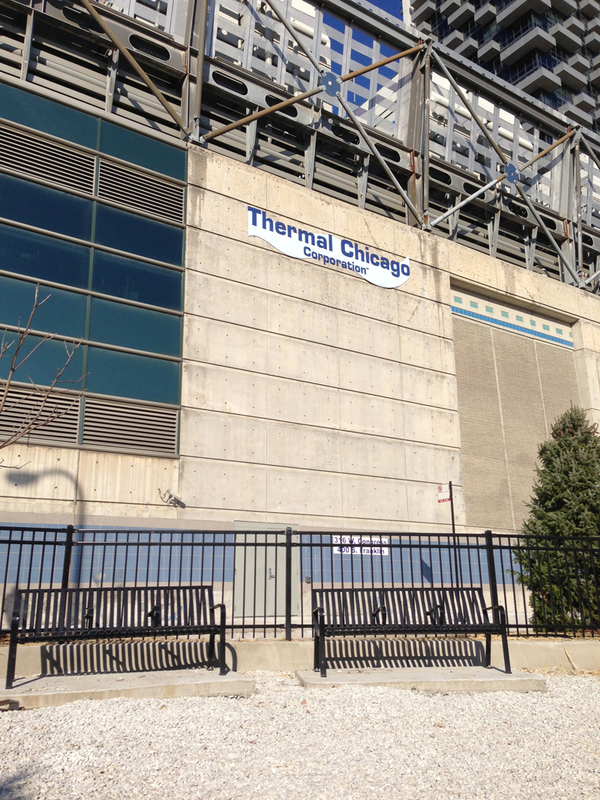 The DFA is located between the Congress Street Freeway and the Thermal Chicago building. Access is off of the west side of Franklin Street. Careful if crossing the street! Cars exiting the Congress St. Freeway through exit tunnels to the south are moving fast! ~5000 sq ft (~0.11 acres) estimated from pre-construction images. 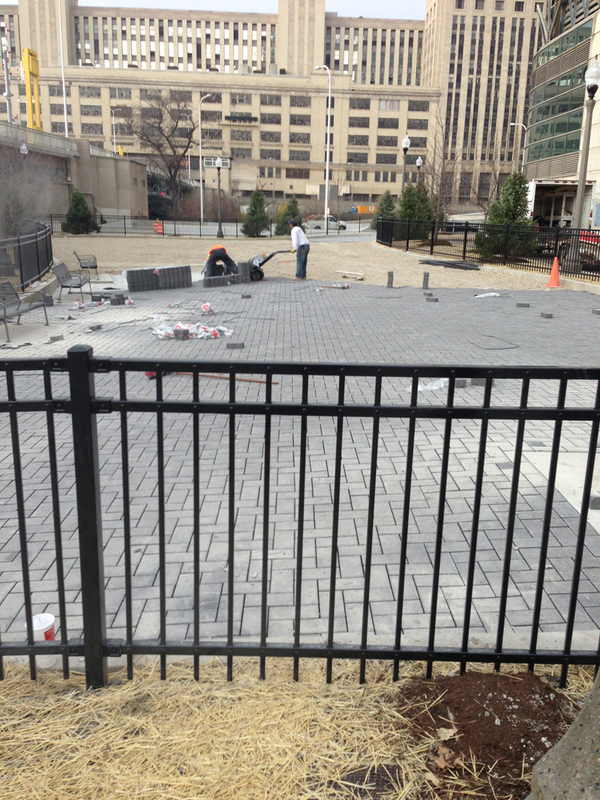 The park entrance and far seating area are surfaced with brick. There is a central pea-gravel area between them. This DFA opened in November 2012. There is a seating area at the far end of the park. South Loop Dog PAC has agreed to support this park and to help build an ongoing community organization to maintain the park in future years. We took action ourselves this saturday and bought 2 brand new poo scoopers and cleaned the entire dog park ourselves after weeks witnessing users leaving behind their dogs poo. We sent you photos of this and of the drug used srynges inside the perimeter of the park that it is our main concern since dogs pick up everything and the public health threat of transmitted diseases it is very real. Several weeks ago CTA did enclose/fenced the viaduct underpass where the dozens of homeless used to gather for drug use and sleep. That is a emergency exit for the Blue Line and they were collapsing that exit with debris. While that action seems to have reduced the amount of them under the viaduct they continue their activities in the park, leaving behind garbage all over the place. It is hard to keep up with this situation unless some action is taking by any city agency or officials to help figure out ways to curb this. Since construction started south of the Harrison St. lot the homeless tent camp population has been concentrating on the small river section across the Postal Office on the west side of South Wacker and they seem to use the Dangelo Dog Park more often for their activities. Status as of today is that Solis’ office is going to try to coordinate information so we can start getting something done. Part of the problem is that d’Angelo Park falls in the cracks somewhere between CDOT/CPD responsibility, and we don’t have a good point of contact about these kind of issues there yet. Again, we’ll update as we have info. There is a man who has been there all throughout the day. White guy in his late 20s/early 30s with a beard. He’s there now. His behavior is a little erratic. I think it’s more of a drug issue than being homeless. I had thought about calling the police but I’m not sure if it’s illegal to hang out in a park all day. We’re aware of this and are in contact with a representative of Alderman Solis’ office. Please send pics to info@southloopdogpac.org. We’ll try to update here and on Facebook as we learn more about what can be done. I was at the park today and took pictures of MULTIPLE syringes–dozens, in fact–and people who looked like they’d been high for days at both the smaller dog park on Franklin (west), as well as the upper D’Angelo Park dog area. It is very clear the park is used as a shooting gallery as well as a place to “sleep it off.” It’s sad of courseIt is only a matter of time before someone, human or K9, gets stuck and sick or worse. This is a VERY real, present and on-going problem that I can’t imagine the police are not aware of. Not that the police are the solution, these people are in grave need of help, but I don’t see any serving or protecting of them or the local dog walkers or pups (who chew things!) going on here. Are these areas on ANYone’s radar? I would behappy to provide pictures and the specific areas where use is apparent. Thanks for this comment. This is the second report of trash issues at d’Angelo DFA that we’ve received recently. We contacted the Chicago Park District and CDOT liaisons again about the issue today. They now report that the trash has been picked up. Please don’t hesitate to contact us either here or by email (info@southloopdogpac.org) if there are continuing issues at this park. I was wondering who was responsible for emptying the trash bins in the park? In the summer, they were maintained on a regular basis, however it appears that they haven’t been cleaned out in months and are overflowing with dog waste.